Whenever someone tells me that search engine optimization (SEO) is easy, I laugh quietly to myself. Sure, with a little research almost anyone can be Google-smart when it comes to SEO. Most might even be able to talk intelligibly about it. “You just need quality content,” seems to be the mantra these days. Of course, we know that firstly, that’s not as easy as it sounds and secondly, there’s more to it than that. One of the biggest challenges is keeping up with the rapid-fire changes within the search engines (you do know that Google makes about 600 changes to its algorithm a year, right?). Take a look at just some of the latest news last month. Earlier this month, Google undertook an experiment on how the search engine results page (SERPs) look. It made it a little bit more difficult to differentiate between organic and paid search results as shown below. Paid search results used to be placed on a beige background. Now, there’s only a small label that says “Ad”. The most popular search engine in Russia, Yandex, has started removing links from its ranking algorithm for certain verticals. They reason that they have been experiencing an increasingly diminished value from inbound links to the point that it is not adding to the quality of its results. Matt Cutts announced last month that Google has tried removing links from its ranking factors but did not get satisfactory results. It’ll be interesting to see how this plays out. Google has finally confirmed that it uses some form of Author Rank in its algorithm, specifically for In-Depth Articles. This seems to validate our prediction that Author Rank will become a huge deal in the near future. Will this encourage a whole new cottage industry of selling Authorship instead of links? 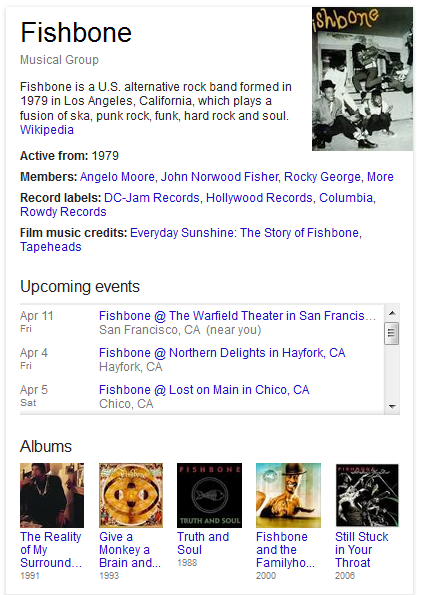 Google continues enhancing its search results pages with even more information from its Knowledge Graph, this month including restaurant menus and concert dates. While this reduces the need for searchers to click through to the websites themselves, certain publishers will find their traffic diminishing over time. Update: Oh, it can also solve your Geometry Maths questions now. A few months back, Matt Cutts’ blog post about the death of guest blogging caused quite a stir within the online community. Google made good on its promise this month by penalizing MyBlogGuest, the web’s largest platform that facilitates the exchange of guest blogging. This was actuated by a manual penalty and you can’t even find the site if you google its brand name now. This has polarized the SEO community. On one hand, there is an increasing number of websites cropping up simply to post low quality guest posts for SEO purposes. On the other, guest posting is still viewed by many as a legitimate method of increasing your readership. Recent reports also indicate that many (but not all) websites that participated in MyBlogGuest have been hit by a manual penalty. This is interesting because MyBlogGuest is neither a link network nor sells paid links. Now that the last bastion of white hat link building has crumbled, what tactics will you be using? Google is looking at ways to make its notorious Panda update even ‘softer’ over the coming months to help small businesses. They have actually softened its blow before, but with only 18% fully recovering from the last update, it looks like it wasn’t soft enough.